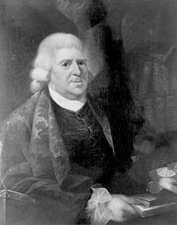 DEXTER, Samuel, a Representative and a Senator from Massachusetts; born in Boston, Mass., on May 14, 1761; graduated from Harvard College in 1781; studied law; admitted to the bar in 1784 and commenced practice in Lunenburg, Mass. ; member, State house of representatives 1788-1790; elected to the Third Congress (March 4, 1793-March 3, 1795); elected as a Federalist to the United States Senate and served from March 4, 1799, until May 30, 1800, when he resigned to enter the Cabinet; appointed Secretary of War by President John Adams 1800; appointed Secretary of the Treasury 1801; resumed the practice of law in Washington, D.C.; moved to Boston, Mass., in 1805 and continued the practice of law; declined the appointment of Minister to Spain in 1815; unsuccessful candidate for Governor in 1816; died in Athens, Greene County, N.Y., May 4, 1816; interment in Mount Auburn Cemetery, Cambridge, Mass. Dictionary of American Biography; Sargent, Lucius. Reminiscences of Samuel Dexter. Boston: H.W. Dutton and Son, 1857.